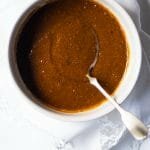 This gluten free, paleo and keto bbq sauce is so awesome, easy-peasy and super quick! Think just 15 minutes and trust you’ll never go bottled again. 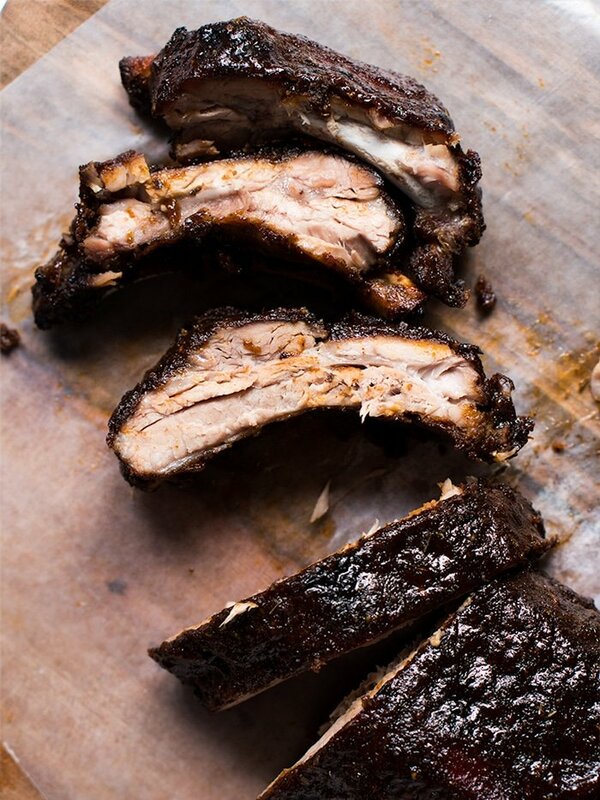 The best things in life take a little work, and BBQ sauce is no exception. So forget the bottled up version (which is more often than not loaded with additives and sugars btw), and make your own barbecue sauce from scratch. Which takes just 15 minutes of your time, so you’ll actually be done before you know it. Let’s start off by stating the obvious: there’s no single best way to make barbecue sauce. As depending on where you find yourself, the ingredients will vary vastly. Starting with the vinegar, ground black pepper, and hot pepper flakes base from South Carolina. This version yields a killer mopping sauce (i.e. to baste the meat while cooking, and as a dipping sauce when served). A double-duty sauce, sort of thing. 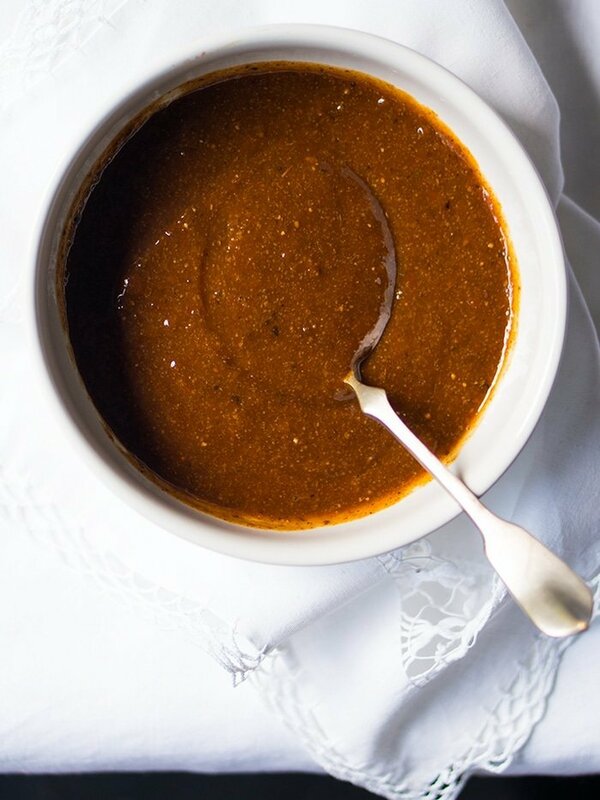 This BBQ sauce can be made with no sugar, keeping it thin and sharp. 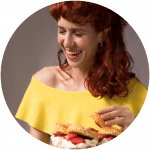 Alternatively, you can add a little sweetener (think xylitol or erythritol) and a touch of thickener (arrowroot or konjac powder) and turn it into a glaze. No go make some BBQ chicken wings (or ribs!). Mix vinegar, olive oil, paprika, oregano, garlic, black pep- per, cumin, chipotle, cayenne, salt and water in a saucepan over medium/low heat. Add sweetener to taste and simmer for 10 minutes. Make a glaze by dissolving the arrowroot or konjac pow- der in a couple tablespoons of water. Whisk the slurry into the sauce. Continue to simmer, whisking constantly to avoid lumps, just until desired consistency is reached (arrowroot breaks down in prolonged heat). Feel free to thin out with more water as needed, or thicken with more arrowroot (keep- ing in mind that your sauce will continue to thicken while cool- ing). For the sweetener here, sugar alcohols work best. And if paleo, or not restricted by sugar, honey, maple syrup etc. also work the charm of course! This sauce is great! I’ve been making it as is for a while. Then, I decided to add one 8 oz can of tomato sauce. BOOM! It’s just like a traditional sauce and even my non-keto/Paleo friends love it! Thanks for this recipe. It is just what I needed to stay Keto and enjoy my barbecue brisket. This sauce is delicious! No surprise there. Can’t wait to try it on some wings and ribs. However for tonight, there will be Gnom-Gnom BBQ cauliflower. YUM! This had the tang and spice! So I’d caution anyone serving it to their families with kids. I made as written and used the smallest amount of cayenne and chipotle. When I tasted it, I knew immediately it was too spicy for my youngest to use as a dip. So I added 1/2 cup tomato sauce and 1/2 can of full fat coconut milk to dilute it. Two untraditional ingredients but I was desperate at that point! lol However strange, it worked. Still had plenty of flavor and kick. I’ll definitely make it again but use even less of the recommended chipotle and cayenne and add more to taste. The color after baking was beautiful, too. Can you provide an amount per serving please? This was beautiful on our ribs, thanks so much for sharing! It seems like something doesn’t quite calculate right in the calorie totals. Looks marvelous! Thanks for the heads up! I’ll look into it xo! 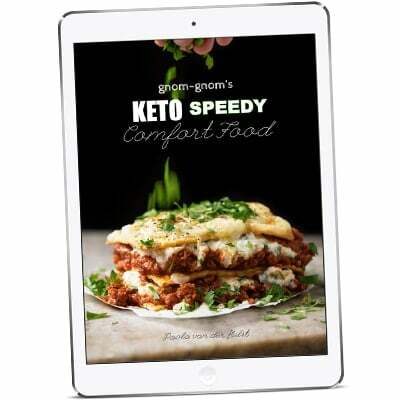 This is one of many great Keto recipes. I have tried a lot of them, and they always come through. Haven’t made the bbq sauce yet, but will next time I do ribs. Keep up the great recipes!